This course will qualify you to work in community & health care settings such as residential care for the older person/ or vulnerable adults and to assist clients to live independently in their own homes. ​Well done to the Social Care QQI Level 5 group for their recent fund raiser in aid of Alzheimer Society Ireland-Kildare home care team. They raised 420 euro for a great cause. Team Leader, Mary Bolger is pictured receiving the donation on behalf of the organisation the 20/11/2018. Thanks to everyone who bought tickets and kindly donated gifts for the draw, it is very much appreciated. This is our Social Care level 5 group and we are starting off the year all hoping to achieve and move forward in the future in a care setting with this course. We are thankful and appreciative of all the Supports and Members of staff who are with us and looking forward to where the future brings us. The QQI Level 5 in Social Care is based on the care of vulnerable people with the community. The modules are varied such as Psychology and Understanding Mental Health. 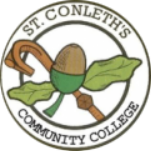 When first entering St Conleth’s Community college, the social care group class was filled with excitement, nervousness and overall determination. At the beginning of the year we were all participating in an ice breaker activates to help form positive relationships, this helped the students in the class feel more comfortable around one and other. When being introduced to all the modules at once it became a little overwhelming, but routine , organisation and good attendance helped us adapt to this new experience. After a few weeks we were introduced to the life of assignments. Completing assignments was difficult at first and attempting to understand the layout, but with the help of drafts, tutors and other students within the class, everyone adjusted to them quickly. The course contains many assignments and can be time consuming, but with strength of mind it can become an enjoyable way of learning the contents of the module, almost like killing two birds with the one stone! A compulsory section of the course is completing a first aid course plus a manual handling course. The first aid course is three days long and is based on how to help in situations if someone is in need of urgent assistance. During this course you are taught how to do CPR and use an A.E.D. The manual handling course is a day long and focuses on how to prevent injuries when assisting a client. Near the end of the course, we are provided with the task of skills demonstration. These are worth a high percentage of the overall marks for your modules. Activities are based on an activity that will positively affect clients. Keeping on top of regular meetings and organisation of planning and preparing is rewarding and a fun way to learn more about the module. During the last remaining weeks of the social care course we are preparing for out exams in April/ May. ​Here our students met with youth workers who discussed the variety of community based youth projects which KYS are involved in with young people around the county. It was a really interested visit and particularly useful for the Module : Working with young people. Thanks again to KYS for supporting us in here in St Conleths Community College. I came in to the course not knowing what to expect. I met a lot of new people and I made friends for life, and I learned a lot about myself as a person and that I really want to have a future career in this sector. The tutors were great guiding us throughout the year and without them I would not have made it to the end of the year. We were introduced to many different modules, as we would have never have learned deeply what they were about; they were all interesting in many different ways. Finishing the end of the year, and completing it is such an achievement, to get all assignments finished, finish presentations and prepare for exams. I really enjoyed the experience and the modules. My most favourite part of the course was my work experience placement. I learned so much that I hope I can pursue in my future career in the social care sector. My favourite modules were care of the older person and understanding mental health. They were so interesting and I would like to work in those sectors in the future. I would advise anyone interested in doing social care to do it. It is extremely beneficial to one who is really interested in that career. Even though it is difficult as there is so much work to it, if you really want it and put hard work into the course it will pay off. I would recommend this course to any future students. Overall the course was a huge benefit to each student. I felt each module linked in with each other which made it easier when doing assignments. It’s a great course for progressing onto college or working. The course has a lot of group work which I felt it benefits you for working in the area of social care as you have to have confidence and work as part of a team. One of my favourite modules I found was mental health as it has a huge impact on society today. There are so many assignments which are part of your end of year result. We have four exams at the end of the year. An example of the modules that take place are health and safety, human growth and development, social studies, communications, work experience, care of the older person, care skills, care support and working with young people. The course prepares you with a 3 week block placement of your choice in the social care area. Overall it was a great course, I would recommend it to anyone who doesn’t know what area they are interested in working and if they like working with people, as choosing what you want to do for the rest of your life can be quite stressful. This course has a broad area you can choose from when you receive your full award. The year was enjoyable. If you wanted to experience what social care is before actually entering a level 7/8 in a university or IT then I would recommend doing the level 5. A lot of practical work was involved such as first aid, patient handling moving, assisting with feeding and assisting with washing. I would say that you have to pay attention in all the modules as there is a lot of learning to take in and especially for exams at the end of the year. There are several modules. They range from Human Growth and Development to Understanding Mental Health. I think understanding mental health was the most enjoyable throughout the year because I have a big interest in it and most people enjoy it. Social studies includes a 50% project and a 50% exam. The project was enjoyable to find out information on ethnic minorities. I picked discrimination on the LGBT community. I found out a whole lot on it while completing this project. We visited the Midlands prison as part of the social studies projects as some people chose to research discrimination on prisoners. A lot of speakers came in to speak to us about different topics. Work placement gave us a good insight in the different areas. The whole year was great and I would definitely recommend it. My name is Clodagh and I completed a year in St.Conleth’s PLC studying Social Care. I found the year went incredibly quick and was most enjoyable. I learnt a lot of new skills and gained more confidence. There is a variety of core modules my favourite one being Social Studies. As part of our research project we went on a trip out to Midlands Prison. This helped me gain experience and knowledge to complete my project. The tutors were most helpful throughout the year. My most enjoyable experience in St.Conleths was my three week placement with Pathways Ireland. I look forward to seeing what the future holds for me as doing the PLC was my baseline for future studies. At the start of the year I was very nervous and didn’t know what to expect. I thought I would struggle immensely with assignments and didn’t know what was ahead of me. Looking back now, I am delighted I did the course. My tutors helped me whenever I needed it and were of great assistance with assignments. There was a lot of work involved but my tutors guided me, which made the year so much easier. As part of the course we completed work experience, which was a great advantage as it gave me an insight into the social care area. I would highly recommend this course as I gained a lot of knowledge and practical skills, which will now help me progress to college. I really enjoyed my year in the PLC course. I found the assignments difficult at the beginning but once I got in the flow of doing them I found them a lot easier. The best thing to do is have your assignments done as soon as you receive them because if you let everything pile up you’re going to get stressed and won’t have assignments done to the best of your ability. I found the tutors extremely helpful with every aspect of the course and the class gelled as a group. I would really recommend this course. At the beginning of the year I didn’t know what to expect, I was feeling very nervous. I made new friendships and met up with old friends too, which was unexpected. The class group bonded really well together as we all got to know each other. I found the course really good and very interesting. The modules were great and they were delivered excellently. I struggled with the assignments at the beginning of the year for a while as it was all new to me along with referencing, but as the year went on the assignments got easier as I was getting used to having three or four assignments at the one time. It was normal to me by then and I learned to get on with it and get through them. I’m not saying the course was easy, but there was always help there from the tutors if it was needed. The good thing about doing the assignments was at the start of the year right through to the middle of the year we could hand up drafts which I found very helpful because we got an idea of how our assignment was coming along, the tutor would read through our assignment and correct it, then we would get it back and fix our mistakes and add more detail if it was needed. The work experience also benefits you as everything you have been learning gets put into practice and it makes it all more real. This course has benefited me as I can now go onto college or go straight into work; both options are there on completion of this course. ​Social Care Student, Collette Craven.